Rivers State was at liberty to leave the ruling Peoples Democratic Party for the opposition All Progressives Congress whenever he so desires according to a report on Punch webpage. The Presidency spoke through President Jonathan’s Special Adviser on Political Matters, Mr. Ahmed Gulak, during an interview session with the newspaper while reacting to a statement credited to Amaechi that he would consult President Goodluck Jonathan on whether or not to join the APC. while receiving the leaders of the APC, who were in Port Harcourt, the state capital, to woo him into their fold. “Before I join the APC, I will consult the President. I will. He is from our zone. I will consult all the consultables,” he was quoted to have said. But Gulak said the governor was only trivialising the issues at stake as he deliberately engages in anti-party activities. 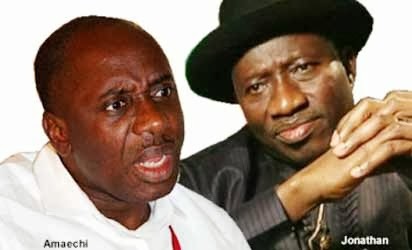 He said since Amaechi did not consult the President before inviting the APC leaders and giving them tumultuous reception in his state, he should not bother to consult Jonathan before leaving. Gulak said, “Governor Amaechi did not consult the President before inviting APC leaders to Rivers State and giving them tumultuous welcome. So, he does not need to consult the President before joining APC because he knows that the President will not allow any PDP member to go to the APC. “Governor Amaechi is at liberty to join the APC; this is belittling the issue. We are not small boys; we are in a serious business of politics. “You cannot, as a governor on the platform of PDP, invite APC leaders to your state and make a show of it and now say that you will consult the President who is the leader of the PDP before you join APC.